So far, no account holder had reported any loss of funds. KUALA LUMPUR: A Bukit Aman special task force on organised crime (STAFOC) is now involved in efforts to track down the suspects, believed to be Latin Americans, who masterminded the syndicate that hacked automated teller machines (ATMs) in the country. Bukit Aman CID Director Datuk Seri Mohmad Salleh said the force had its own expertise in tracking down the suspects. STAFOC is an elite unit of the police force with multi-tasking capability formed in January this year to manage and tackle serious crime, illegal syndicates, gangsterism, gambling, vice and human trafficking. So far, no account holder had reported any loss of funds, he said when contacted Friday. 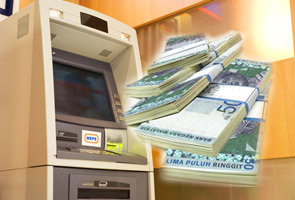 The syndicate is reported to have hacked 17 ATMs in the federal capital, Selangor, Malacca and Johor Baharu involving losses totalling more than RM3 million. Meanwhile, Bukit Aman Commercial Crime Investigation Department director, Datuk Mortadza Nazerene when contacted said several individuals had been called up to give statements on the case.